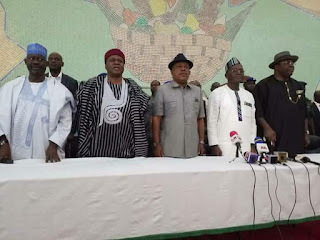 National Chairman of the Peoples Democratic Party, PDP, Prince Uche Secondus and the Governors of Bayelsa, Taraba and Gombe States, Dr. Seriake Dickson, Architect Darius Ishaku and Alhaji Hassan Dankwambo, yesterday said persecution will only increase the popularity of Governor Samuel Ortom. They stated this at the New Banquet Hall of the Benue Peoples House Makurdi during a solidarity visit to the Governor. Prince Secondus stated that the illegality going on in the state supported by forces from Abuja was unfortunate, stressing that Nigeria was in deep crisis especially in Benue state. While pledging the support of the PDP to Governor Ortom, the National Chairman of the party said the Governor's "offences" were that he stood with his people in seeking justice in the face of persecution and had also defected to the PDP. He said Benue people and not Abuja forces will determine what happens in Benue, adding that all clandestine attempts to pull the Governor down will not succeed. Speaking on behalf of the three Governors, Dr. Seriake Dickson urged Benue people to continue to stand with their Governor in order to protect democracy, stressing that the legislature must be allowed to function according to the law. He consoled the people of Benue and other states over what he called senseless killings by militia herdsmen, adding that the situation going on in Benue State was mindless. Governor Ortom in a remark said despite the persecution, he remains committed to ensuring justice, fairness and equity for his people. While appreciating the PDP National Chairman and his colleagues for the solidarity visit, the Governor assured them that Benue remains a PDP state and would emerge victorious in 2019. Governor Ortom informed the gathering that as part of the witch hunt against him and Benue people, the Inspector General of Police had ordered the withdrawal of policemen from all the Internally Displaced Persons camps across the state, leaving the IDPs vulnerable. State Chairman of the PDP, Mr. John Ngbede in a vote of thanks, charged Governor Ortom to remain firm in spite of intimidation, stressing that such would only enlarge his support base.